U.S. President Donald Trump, center, Canadian Prime Minister Justin Trudeau, right, and Mexican President Enrique Pena Nieto at a signing ceremony for the new U.S.-Mexico-Canada Trade Agreement, Buenos Aires, Argentina, Nov. 30, 2018 (AP photo). President Donald Trump has announced a number of trade deals this year, touting each one as the best, greatest, most wonderful agreement ever. Time after time, however, the reality fell far short of Trump’s hype, including the most recent announcement of an agreement with China. Indeed, the announced “agreements” with Europe, Japan and China merely began the process of negotiating. 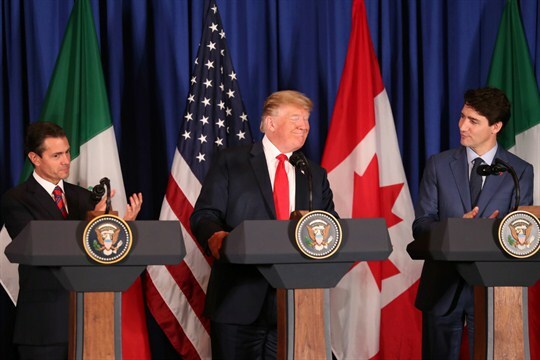 And far from replacing the “worst trade deal ever,” the U.S.-Mexico-Canada Trade Agreement mainly updates and tweaks the North American Free Trade Agreement, or NAFTA.